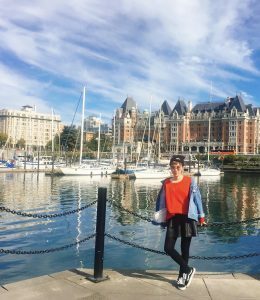 Today I want to introduce you to Nara, a girl who lives in Shanghai and works as marketer in U.S Co. 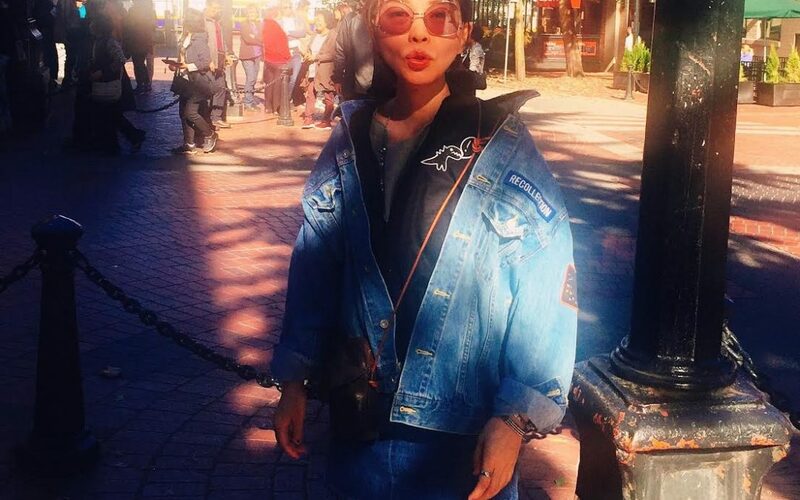 When she sent me some pictures of her trip to Canada, I realized that her way of wearing an oversize denim jacket matched perfectly with the post I was preparing on how to wear this garment, so here you have her proposals as a perfect example of streetstyle, the true application of a person, from my post on Monday. On the cover of today’s post, overlapping garments, oversize denim jacket by MOUSSY, with sweatshirt by agnès b (a French brand I personally adore), one of the proposals of my post on how to wear this garment, the most casual proposal. In the following image the same jacket with pullover by agnès b and leather skirt by MOUSSY, the look you need when autumn temperatures fall. “Topping off” the casual look with sneakers (in this case by VANS) is, nowadays, something as natural as breathing. I met Nara a few days ago when she was spending a few days on vacation in Madrid. We were waiting for a coffee … I loved her glasses! 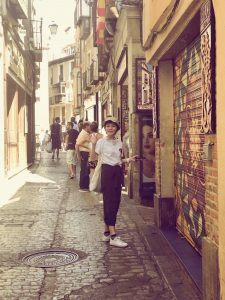 That day Nara wore a more summery look, in Madrid in September it’s still hot. A forest green bib bought in Hong Kong, a fantastic place where I lived for a month and still have a friend, Wendy. It is a very fashionable casual garment that allows you to create overlays playing with textures and colors. Underneath the Champion t-shirt, that adds the always necessary sportswear touch, a basic item that becomes the wild card of any current casual look. Difficult to face the streets of the cities of central Spain without wearing a hat that protects you from the sun! As for accessories, sneakers once again, the essential footwear to travel the miles that await you visiting the myriad of cultural and leisure attractions of Madrid, my wonderful city, which I constantly go through in my Personal Shopper service, leading to discover to my customers small hidden “jewels”, stores full of fashion items that add personality and interest to their look. 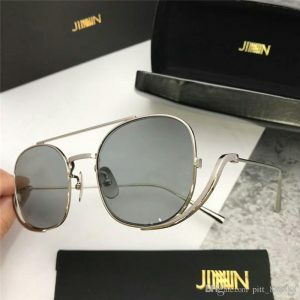 To give personality and modernity to the look, Nara has chosen a markedly feminine accessory, some fabulous glasses by Jinn, a Korean brand, that deserve special attention. Nara, thank you very much for your help and for having agreed to share your style tricks with Md Personal Shopper.